By 1900, Riverside had become one of the premiere winter-resort communities in the nation. Surrounded by twenty-thousand acres of Washington Navel orange groves, Riverside served as a center for agricultural innovation, bringing the revolution of corporate capitalism to the southwestern United States through the modern citrus enterprise. Located in the broad, inland valley of the Santa Ana River in Southern California, Riverside counted among the wealthiest communities per capita in the nation. 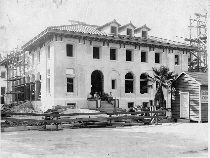 The University of California Citrus Experiment Station (which later became the University of California, Riverside) brought a tradition of groundbreaking scientific research to the city. Riverside’s renowned Mission Inn Hotel, and its inspirational role in the development of the Arts and Craft Style, attracted some of America’s foremost entrepreneurs in search of new recreational, aesthetic, and business opportunities. Riverside became a magnet for prosperous, educated practitioners of the Arts and Crafts Movement in the West. The Riverside Municipal Museum (RMM) opened in the basement of City Hall on December 12, 1924, when the widow of National Biscuit Company (NABISCO) magnate Cornelius Earle Rumsey donated his collection of Native American artifacts to the City of Riverside. The City Council adopted an ordinance on August 27, 1925, amending the City Charter and establishing a Municipal Museum. (The current ordinance states that, "All collections and exhibits of the Museum shall generally reflect but shall not necessarily be limited to the specific interpretations of the history, natural history and anthropology of the City and County of Riverside and the immediate environs of southern California.") From 1924 on, the collections have grown, typically through donations by prominent citizens and organizations, contributing to RMM holdings in the disciplines of local history, natural history, and anthropology. The RMM remained in the basement of the old City Hall building on Riverside’s Seventh Street (now Mission Inn Avenue) until 1948 when it moved across Orange Street into the former Post Office and Federal Building it occupies today. The old Post Office and Federal Building, is a Renaissance Revival-style structure, built between 1912 and 1914. The main exhibits, administration offices, anthropology, natural history curatorial offices, collections storage, and registrar’s office carried on their activities in this building. The history curatorial office, collections, and exhibits services eventually moved to an annex, a converted Safeway Supermarket, located four blocks from the main building. During the early 1960s and '70s, the RMM broke out of its traditional role as a depository of donations from City notables. New exhibits and community-oriented programs, made possible by substantial involvement of the Junior League of Riverside, brought about an expansion of the Museum to all floors of the building. The Museum was remodeled into its current configuration between 1962 and 1965. Museum staff expanded from three to twenty-eight paid positions. World famous naturalist and Riverside resident, Edmund C. Jaeger, served as Curator of Plants. His presence inspired the Junior League to fund the creation of the Nature Study Lab facility in his name. Accreditation by the American Association of Museums (AAM) came in 1972, with the visiting committee’s report citing the RMM as a model institution of its type. A product of the Junior League’s involvement in museum programs, the Riverside Museum Associates (RMA, a 501(c)(3)-status membership organization and a California non-profit corporation) officially incorporated as a private supporting group for the Museum in 1963. The RMA came to form the basis for continuing community support for the RMM, providing volunteer services as well as financial assistance. In 1969, the RMA and the Junior League helped expand RMM programs through the purchase of an 1891 Queen Anne-style home, today known as "Heritage House" (located on Magnolia Avenue, six miles from the museum). The Museum eventually fully restored the home for use in local history interpretation as a house museum, and the RMA transferred title to the property to the City. In 1987, the National Park Service placed the main museum building and Heritage House on the National Register of Historic Places. In 2004, the Museum acquired the Harada House, which the Parks Service had previously placed on the National Register in 1990. The following year, the Riverside Municipal Museum changed its name to Riverside Metropolitan Museum to reflect its growing importance and stature in the community and region.